In 1950, John M. Olin, leader of Winchester Ammunition and chairman of the Board of the Olin Corporation, fulfilled a dream. His goal: To establish a quality hunting dog kennel and training facility as well as a hunting preserve to promote the sport of duck and upland game hunting, shooting and development, game management and conservation. The chosen site was a 650-acre tract 12 miles north of East Alton, Ill., home of Winchester Ammunition and Olin headquarters. The farm landscape was gently rolling hills, hardwood forest and fertile cropland. The kennels were built in 1950, followed two years later by a hunting preserve. The selected breeds were English setters, English springer spaniels and Labrador retrievers. Olin's passion for Labradors began in the 1940s, when W. Averell Harriman, Secretary of State under Franklin Delano Roosevelt, introduced Olin to the black dogs. The devotion and dedication of Harriman and Olin to Labradors not only promoted the breed to American sportsman, but advanced field trial competition and selective breeding. Olin's search in naming his farm/preserve resulted in a corporate contest, ending when an employee submitted the title "Nilo," Olin spelled backwards. The boss loved the name, the lucky employee received a bonus, and to further fuel Olin's fire, someone suggested that Nilo was also "lion spelled sideways." Olin was an industrialist, philanthropist and conservation leader, as well as a highly competitive sportsman. He assembled the best staff possible to manage Nilo Farms and promote Winchester Ammunition. T. W. "Cotton" Pershall was hired to oversee the farm and wear the title of head trainer. The remaining Nilo staff was carefully selected -- with a requirement of dedication and loyalty to the task. A home was constructed on the grounds for Pershall, and an existing farmhouse was renovated to become the clubhouse. Other structures were designed and built for equipment, workshops and storage. The state-of-the-art kennels and trophy room added character and class to Olin's realization of his dream. The duties of head trainer and preserve manager were soon divided, when Leo George joined the staff as manager to allow Pershall to dedicate more to dog training. Nilo's fame and popularity quickly spread throughout the outdoor community. Olin staff writer John Madson wrote documents on small-game research, conservation and hunting. Revered outdoor writer, Nash Buckingham, became a frequent guest to hunt, shoot and write, exposing the shooting public to new innovations in Winchester Ammunition. Buckingham's "stamp of approval" helped convince Olin to begin mass production of the Winchester Super X high-density plastic hull shotgun shell loaded with Lubaloy shot. The shells became the choice of America's waterfowlers. Legendary exhibition shooter, Herb Parson, was employed to entertain guests at Nilo, displaying his skill and uncanny ability to break clay targets shooting a Model 12 Winchester. Future Hall of Fame baseball players loved coming to Nilo, among them, St. Louis Cardinals Stan "The Man" Musial, Enos Slaughter, Red Schoendienst and Ted Williams. Manager Whitey Herzog and broadcaster Mike Shannon joined them to polish their shooting skills. TV star Arthur Godfrey had the cameras rolling on a visit and writers from major hunting and shooting magazines begged for the Nilo assignment. Hollywood cowboys Robert Stack, Rod Taylor and Roy Rogers' sidekick "Gabby" Hayes were on the guest list. It was rumored that Mr. Olin's favorite cowboy, John Wayne, spent time at the farm and Olin mansion. Of all the stars and celebrities who graced the grounds of Nilo, no one could have imagined a black dog would be the one to make Nilo Farms legendary and known worldwide. The dog's name was King Buck. Mr. Olin had seen the rookie Labrador retriever compete in field trial competition and recognized his potential. He purchased the dog for a record price of $6,500 in 1951. Many people thought Olin was crazy, but little did anyone know Buck would become the Babe Ruth of the dog world. As a pup, Buck had won a near-death battle with distemper. He was small by Lab standards, but under the guidance and training of Pershall, Buck began his road to fame. "King Buck seemed to have some power of knowing the competition, and always came through, winning trial after trial," Pershall said. He was the first Labrador to win back-to-back national championships in 1952 and 1953, establishing a still-standing record by completing 83 national championship series out of a possible 85. Buck was also a natural in the wild. "Buck was one of the finest wild duck retrievers I have ever seen," Olin said. "He was beautiful to watch." In 1959, Maynard Reese, acclaimed Iowa artist, and two-time winner of the Migratory Waterfowl Stamp Art Competition, earned King Buck his final mark in history. Reese's watercolor, depicting Buck with mallard drake in mouth and ducks flying in the background marsh, became the federal duck stamp. It was the first time a dog ever appeared on a U.S. stamp. King Buck is the only dog to grace a federal duck stamp, and it is likely he'll be the only one, because the contest rules now state waterfowl only. Reese's color portrait of Buck is proudly displayed above the fireplace in the Nilo clubhouse. 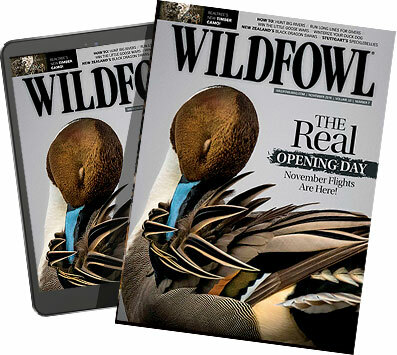 In the 1970s, when dispensed lead shot poisoning waterfowl became a national environmental issue, hundreds of hours of research on the crippling of waterfowl by shooting non-toxic shot was conducted at the farm. Herman Bockstruck, head of ballistics, published his team's findings and determined that crippling far outweighed the lead poisoning issue. However, the study at Nilo led to further research and development of effective, non-toxic loads used in today's waterfowl hunting. The Winchester Division of Olin Industries has seen fit to continue the legacy of Nilo Farms. cial," said Roger Jones, the farm's long-time manager. "It really hasn't changed much over my almost 30 years on the staff. We did add a sporting clays course several years ago, but physically it's still the same, a one-of-a-kind." Ed Campion has been on the Nilo staff for 40 years, Dennis Taylor for more than 30 years and Dean Pitts for more than 20 years. Like Jones, they are proud to carry on the tradition. Jones was asked to name one individual out of the thousands who have passed through the gates of Nilo who left a lasting impression. Without hesitation, the Nilo manager spoke of General Norman Schwarzkopf, the leader of Desert Storm. "He was not only a gentleman, but you could tell he loved America and loved to hunt," Jones said. "I'll always cherish the two days we spent together." Nilo is an accredited Illinois Shooting Preserve and serves nearly a thousand registered hunters during the six-month season from mid-October until the end of March. The Ronald McDonald House, Boy Scouts of America, Ducks Unlimited and other special interest groups contract Nilo to host fund-raising shoots. Since 1971, when President Richard Nixon declared the last Saturday of September as National Hunting and Fishing Day, Nilo hosts the public to an unrivaled celebration. Buck, as painted by Maynard Reese, is the only dog to appear on the federal duck stamp. Thousands of camouflage-clad visitors take part in shooting, archery, dog demonstrations and a variety of outdoor entertainment. Young people are the focus of the event, hopefully to start them on an outdoor adventure that will last a lifetime. During the season, hunting and shooting safety remains the main focus of the farm as individual and corporate groups fill the hunting calendar. John Olin lived into his 90th year before passing away in 1982. During his life, he entertained royalty, hosted four U.S. presidents, established Olin Corporation as a front-runner in industry and made Winchester Arms and Ammunition the leader in outdoors America. Recognized as a master inventor, his name appeared on 20 patents, many dealing with Super X advancements. His other accomplishments are numerous, but Olin's pride and joy was his farm, kennels and the pleasure and purpose they contributed to so many sportsmen. The "River Bend" area of the mighty Mississippi River of Illinois is blessed to have the landmark of Nilo and the headquarters of Winchester. The cowboy rider on the galloping horse is an American icon. If you use your imagination, you might see a black dog following close behind. Larry Reid of Alton, Ill., is host of "Outdoors with Larry Reid," which airs Sundays at noon on WBGZ Radio, 1570 AM.